'I Knew It Wouldn't Be Easy,' Outgoing Health Secretary Sebelius Says : The Two-Way With Kathleen Sebelius leaving as health secretary, the president is turning to budget chief Sylvia Mathews Burwell to run the agency that oversees the Affordable Care Act — better known as Obamacare. Health and Human Services Secretary Kathleen Sebelius, who has borne the brunt of criticism for the troubled rollout of the HealthCare.gov website, said Friday that as she prepares to leave that agency she is thankful to have had the chance to work on "the cause of my life." Her agency, Sebelius said, has been "in the front lines of a long overdue national change — fixing a broken health system." President Obama, at a White House ceremony in which he formally announced Sebelius' decision to step down and nominated her successor, conceded that both he and Sebelius have had their share of bumps from the hard political fights over health care and the Affordable Care Act. But, Obama insisted, Sebelius "got the job done." Obama is nominating his budget chief, Sylvia Mathews Burwell, to succeed Sebelius. Vice President Biden (from left), Health and Human Services Secretary Kathleen Sebelius, President Obama and Budget Director Sylvia Mathews Burwell at the White House Friday. Sebelius is stepping down. Burwell is being nominated to replace her. We updated this post as the White House event was happening. Scroll down to see what was said and to see some of the reaction to the news of Sebelius' departure. Saying she is "humbled, honored and excited ... by the opportunity to build on the achievements" of Sebelius and Obama, Burwell thanks the president. After thanking Obama for "the opportunity of a lifetime," Sebelius says she "got to be a leader of HHS during these most historic times. ... We are in the front lines of a long overdue national change — fixing a broken health system." It was "the cause of my life," she says, and "I knew it wouldn't be easy." Of his nominee, Obama says Burwell is a "proven manager and she knows how to deliver results." "I hope the Senate confirms Sylvia without delay," Obama adds. Addressing the health care act's troubled launch, Obama says of Sebelius that "she's got bumps; I've got bumps." But, the president continues, Sebelius "turned the corner, got it fixed, got the job done, and the final score speaks for itself." He cites administration statistics showing 7.5 million people signing up for Obamacare as evidence. As the president, Sebelius and Burwell come to the podium in the White House Rose Garden, there are cheers from the staff in attendance for the outgoing secretary. 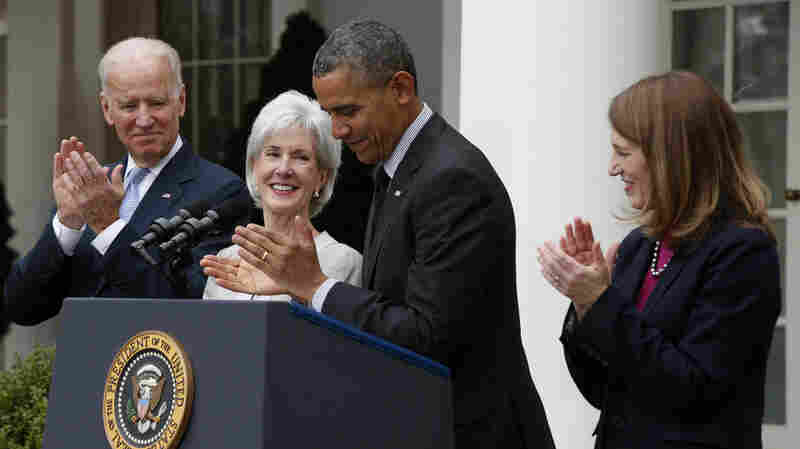 Of Sebelius, Obama says he will "miss her advice ... friendship ... and wit." Burwell, he adds, has those traits "in abundance." -- Fox News reports that "Republicans responded to news of Health and Human Services Secretary Kathleen Sebelius' resignation from the Obama administration on Thursday with fresh calls to repeal the president's health care law." -- The Wall Street Journal predicts that the 48-year-old Burwell, "a veteran of the Clinton White House and Treasury Department who has held senior roles at the Bill & Melinda Gates Foundation and the Walmart Foundation, will face close scrutiny because the agency she has been tapped to run oversees some of the most polarizing and expensive parts of the federal budget." Still, The Washington Post notes that Burwell "is popular on Capitol Hill. The Senate confirmed her as OMB director 96 to 0 almost exactly a year ago." She will need to be confirmed by the Senate before becoming HHS secretary. -- Politico says that "for all of the accomplishments Sebelius could have been remembered for — getting the massive pieces of the Affordable Care Act underway, negotiating with the states, writing the complicated rules needed to make its interconnected parts work — the one thing that will always define her legacy is the website disaster that happened on her watch."